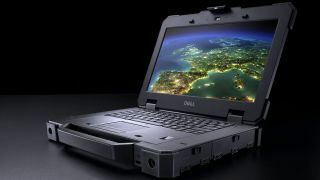 Dell has introduced two new 'Rugged Extreme' laptops – fully ruggedized IP65-rated devices that can withstand jets of water and dust. Designed to go toe-to-toe with Panasonic's Toughbook range, the Latitude 14 is a 14-inch notebook with latest-generation low voltage Haswell Intel Core processors, up to 512GB of solid state storage, up to 16GB of RAM and a 6 or 9 cell battery for at least 12 hours of working. The 3.54kg laptop also features a resistive touch screen comprehensive connectivity, with everything from HDMI to VGA, PCMCIA and an optional Gobi 4G modem. The Latitude 12 is a convertible tablet that apes the design of Dell's XPS 12, with a hinged multitouch screen. It even has a rear-mounted camera for use when it is in tablet mode. The 11.6-inch device also features a 4-cell battery, though Dell says it will still be enough for all-day working. Both laptops have a new docking system and can ship with Windows 7 Professional or Windows 8 Pro. The existing semi-rugged Latitude E6430 ATG will be discontinued, while there will be a new semi-rugged Latitude 14 later in the year. Prices for the new Rugged Extreme range will start from AU$4999, and will be available from May. We'll be getting hands on with both laptops shortly on TechRadar and TechRadar Pro.